We've blogged before about how much we like location-based services and at Google we want all developers to be able to build these cool applications. That's why we're so excited about the W3C Geolocation API, a browser API that provides a really easy way for web applications to get the user's location. Today we're announcing the launch of My Location on Google Maps, the first major Google web application to make use of the Geolocation API. My Location on Google Maps offers the same functionality you're probably familiar with from Google Maps for Mobile - simply click a button and your location is shown on the map with a blue dot. Until recently, providing this kind of functionality usually meant writing a native application, which is hard work if you want to deploy on lots of different platforms. What's great about the Geolocation API is that it can be used by any web application, in any web browser that supports it, in a totally cross-platform way. 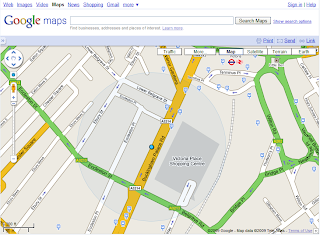 Both Google Chrome and Firefox 3.5 already provide geolocation in the browser, Opera 10 will soon add support and we're looking forward to other major browsers adding support soon. As an interim solution, Gears also provides an equivalent Geolocation API and can be installed on other browsers such as Internet Explorer. We look forward to seeing lots more cool web applications make use of the Geolocation API! Is it My Location or My ISP's Location? I'm in SoCal, but it shows Phoenix. If you have Firefox 3.5 (W3C Geolocation API) or Chrome (Gears), it should be based on WiFi signals around you. Is this limited to mobile phone location or pcs connected to fixed line broadband?